The First Pillar of Scaling - People. Even though many of us entrepreneurs choose to operate as sole-traders, there comes a time in our business when we must decide to accept the status quo, and whatever limitations come with that, or decide to scale the business to something much bigger than we have right now. A decision to scale our business means stepping outside of our comfort zone and building execution capability that gives us the chance to succeed at a totally new level. This does not come without risks. It means that we must invest in our business and in ourselves. It requires us to add a layer of complexity to our business that may initially make us feel uncomfortable. It requires us to look outside ourselves and to accept our personal limitations. It frequently means putting our own money or savings on the line. This post is the first in a series of 3 posts, which look at how we might approach scaling our business. 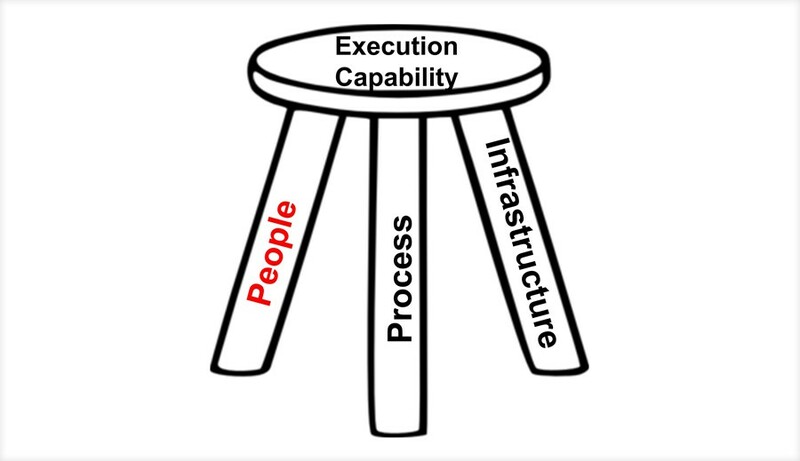 There are 3 essential components to any business – people, process and infrastructure. To scale a business, we must add people, build business processes and put the right infrastructure in place to support a redefined bigger business. Importantly, we must also have the right business strategies in place and we must sequence them to so that things happen in the right order. The sequence will be different for each business. However, the 3 pillars remain the same. This first post in the series deals with people. When we are sole-traders, we make every decision ourselves. We are agile and can make decisions quickly. We rarely seek advice before making these decisions. However, once we recruit people to help us to run our business, we are creating a whole new dynamic and we have to learn a whole new skill set. We have to avoid losing our agility. Hiring people should not slow us down or make it more difficult to take decisions and implement them. Instead, it is all about recruiting the right people, empowering them by setting clear goals and objectives, making them responsible and accountable, and then standing back. Have the courage to hire people that are smarter than you, as this will help overcome any limitations you may personally have. Click here for the full article, which deals with defining roles and responsibilities, effective recruitment and leadership style…….